Katherine Hepburn would have loved Suket Dhir. The legendary Hollywood actor broke deeply gendered costume conventions in the 1930s, wearing mannish trousers, blazers and shirts both onscreen and off it. The Oscar winner was so attached to her uniforms that she once famously spent a day on set in her innerwear when her blue jeans were confiscated. Women like Hepburn have blurred gender conventions through the 20th century with their sartorial flair, leading to the current scene when androgyny is a bona fide fashion trend. Dhir, known so far as a menswear designer and India’s first recipient of the International Woolmark Prize isn’t one for trends, but his first ever collection for women situates itself neatly in fashion’s current movement towards androgynous, gender-fluid silhouettes. Titled He for She, the collection is aimed at women who love borrowing from men’s wardrobes. “It’s not unisex; it’s not androgynous, it’s unapologetically menswear for girls," says the Delhi-based designer, offering a closer look at the designs displayed in his Lado Sarai studio in Delhi. Dhir, over the years, has become synonymous with a new visual language in the Indian menswear scene, one that weaves together handlooms and natural fibres with impeccable, innovative tailoring. Think airy mulmul blazers, tailored shirts with a wide side-seam and buttons stitched in multicolour threads, trousers with extendable waists known as the magic belt or what Dhir calls the “extra paratha" belt, bombers and jackets that are prettier on the inside in contrasting prints and colours. Then there are the best-selling bullet shirts, that Dhir calls a personal favourite. “We do this shirt in 15 colours and a few prints, and it kept the label afloat in our first four years," Dhir says of the design, which was originally inspired by the kurtas worn by Jat men in Punjab. Dhir’s colour palette is wide and bold, going from rich indigo to bright salmon, and the designs infuse structured and straitjacketed menswear silhouettes with movement and a sense of lived-in comfort. “It’s all about precision and finishing," he says. “There’s a versatile transformation in these pieces, so you can wear these at home or step out in them. It’s not about menswear, womenswear, evening wear, daywear, summer or winter—it’s just a beautiful piece of clothing you can wear whenever you feel like it." Indian craft traditions underscore each of the designs, be it the handloom base of the garments or the motifs incorporated in the prints and weaves. There’s also an element of storytelling in the garments: inspired by Pahari miniature paintings, the embroidery reimagines Indian royalty in a contemporary context. Instead of traditional shikar (hunting) scenes, Dhir’s embroidered royals are seen playing golf, riding Segways or taking selfies. In keeping with the season (the debut collection launched in November), the garments are aimed at winter. There’s a hint of festive detailing, but pared down into what Dhir calls a sombre sheen. The brocade is washed down for reduced shine. “It’s a sombre sheen, for people who want to sort of dress up that way for festive occasions," says Dhir. “I relate to the kind of people who want to be themselves but sometimes have nothing to wear for formal occasions." Dhir’s collection is meant for the woman who loves putting her own spin on classic menswear—his wife Svetlana. “My wife is my muse. Svetlana likes throwing on men’s clothes but she can make it look feminine," he says, adding it’s easier for women to borrow from men’s wardrobes than one might think. “I instinctively recommend couples sharing clothes if they are the same size. It’s all about styling and individual energies." Dhir recommends unusual pairing for his separates, especially in winter, not just with jeans and T-shirts, but also Indian ensembles. The lightweight brocade blazers make a chic replacement for shawls over saris while the long jackets and bombers can be worn as an overlayer with a salwar-kameez. 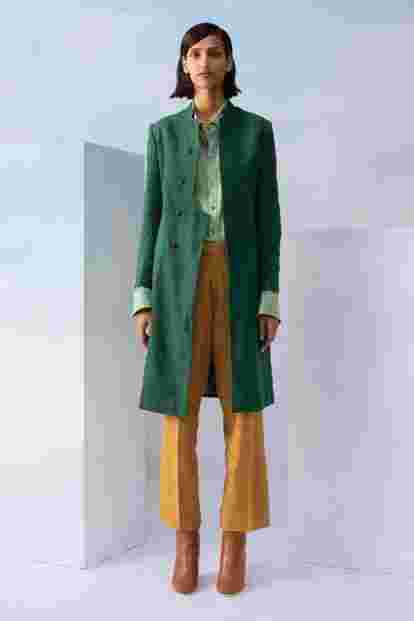 The inherent versatility of these separates, the designer hopes, will also address another challenge that often plagues women’s fashion—repeatability. Dhir doesn’t identify with sustainability as a trend, but his design ethos is founded on the principles of slowness, durability and longevity, creating only one collection a year, using materials that have a positive impact on artisans and creating designs that lasts for years in the wearer’s closet. “It’s not normal designer language, but this is what makes us us," he says. As a menswear designer, Dhir confesses to never having worried about whether his designs will outlast one wear or five. “Men wear their clothes again and again, especially if they love it. They don’t care about repeating them whereas with girls, there’s a ‘I wore this last time, what do I wear this time’ zone," he says. Dhir hopes his clothes will occupy the middle ground between statement ensembles and everyday staples, with enough tailoring and design details to tell a new story every time. 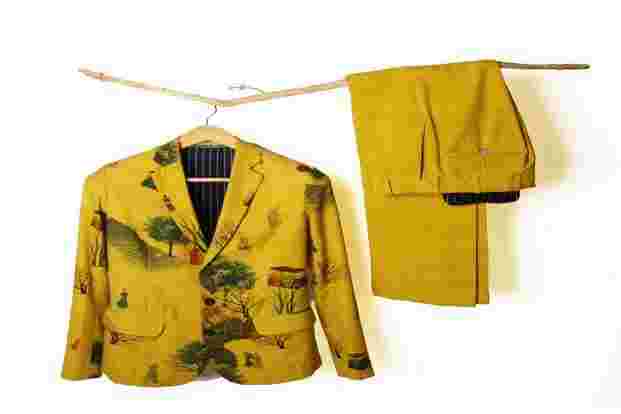 “The whole idea was to make clothes that can be icons in your closet. These are pieces that everyone praises and loves or remembers, so you don’t mind wearing them again and again".